Sausage rolls are steeped in folklore in my family and if you ever have the good fortune to listen to my mother at a party, cornered in the kitchen, late on a Saturday night, after she's had a few Tia Maria's, you'll soon find out why. Because we don't have parties like we used to. Not like back in the good old days, when she used to live above the shops in Eversholt Street in Camden with her grandparents. Gawd blimey, love a duck, wot? Wot the parties that used to go on in that place were legendary! Mythical even. By all accounts Grandad Billy would often get kicked out of the local boozer at 11 o'clock on a Friday night and not happy with his lot, he would corral a bunch of miscreants to come back to the flat to carry on with the celebrating. Twelve nine and four sixpence would be slapped on the bar and the boys would hoist wooden crates onto their shoulders, carrying bottles of mild and waltz off daaan the street singing an ol' ditty like "Oi Sally, How'd You Get Yer Knickers In Twist?" Grandad Bill would hammer on the door and announce "Alice! We gort guests so we 'ave," and Nanny Alice would stub her woodbine out and leap out of her chair and shout "Oh Bill, you are a bleedin' pain in the backside and no mistake but sod it, come on in boys." Bottles would be popped and more carousing would go on, culminating in a riotous cheer as Grandad Bill would pull the throw orf the ol' johanna and everyone would leap in with a chorus of "Aunty Mabel On The Table." Spoons would be handed out for percussion, dust would leap into the air from all the dancing and my mum would awake and walk into the room and immediately get half a guinea of threepence coins thrust into her hands. If she was really lucky, she'd get 12 bob note. Soon enough Grandad Bill would shout something like "Alice, we're 'ungry!" And before you knew it, Alice would be in kitchen, sleeves rolled up, port and lemon on the side, woodbine dangling from 'er lips and out came the flour, water and lard. Working like a demon, she could knock up a ball of pastry in seconds and after quickly dipping into the fridge, a slab of sausage meat would slapped on the side (for they always had sausage meat in the house). 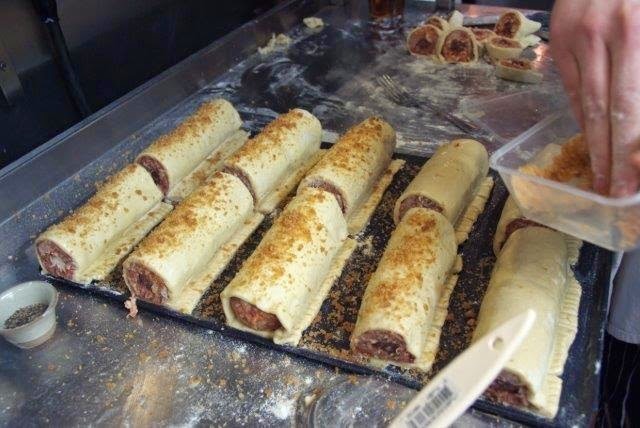 With a rolling pin, some deft finger work and a splosh of egg wash, snake-lengths of sausage rolls would start to materialise before being cut and shoved into a hot oven for 25 minutes. By this stage, the boys would be onto their fifth round of "Ooooh Mrs Pembury, You've Got A Lovely Daughter" and would be getting rather drunk but when Nanny Alice walked into the room, with the smell of roasted unidentifiable pork and crisp, flaky pastry wafting through the air, everyone would stop dead still. And pause. Before leaping upon the tray with gay abandon with many a thank you's and much obliging. Nanny Alice would then take centre stage and give everyone a blast of "No Thank You Mr Tiggywinkle, I've Already Had Me Chips For Tea." To much riotous applause and laughter and smashing of bottles on the ceiling and these sort of parties would often go on until Sunday afternoon; a constant stream of frolics, booze and of course, lots and lots of lovely, laaavely sausage rolls. You can probably detect that I am taking the michael here and whenever I get to hear that story, I do usually get a thick-ear but the fact remains, that sausage rolls form a cornerstone of my family heritage. And despite the overwrought nostalgia, Nanny Alice must have rubbed off of my mum because she can make a mean sausage roll at a moments notice too. With that tale in mind then, when I got asked to judge at 'The Red Lion Great Sausage Roll Off' earlier this year, I jumped at the chance. 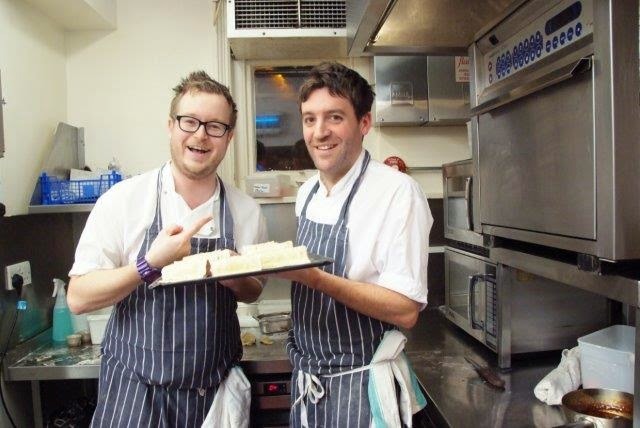 Organised by handsome couple Angus Mckean and Claire Morgan, who together run the award winning Red Lion pub in Barnes (in relative harmony, so long as Angus does everything that Claire says) this competition to find the best sausage roll in the country is only in its infancy but has already made waves amongst the cheffing community. 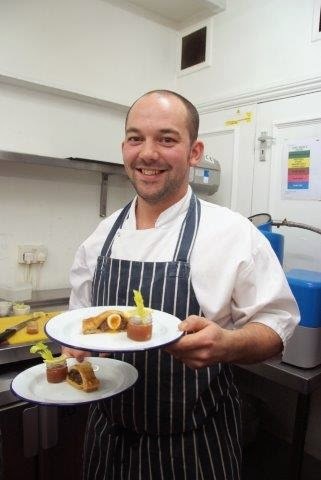 In the words of Angus, this sausage-and-pastry fest is really "just a healthy night for all those in the trade to let their hair down and have some fun" but there is ambition in the Master Cellarman's twinkly eyes as he would like to attract some heavyweight Michelin starred chefs to the event. The crowd that assembled way back in January was not too shabby though, with culinary luminaries assembling from Nanban, The Bull in Highgate and The Opera Tavern. And my fellow judges were no less impressive either, coming in the voluminous shape of Charles Campion (he that critique food), Hayden Groves (he that is National Chef of the Year 2013) and Lisa Faulkner (she that won Sleb MasterChef and caught Mr Torode's eyeballs). 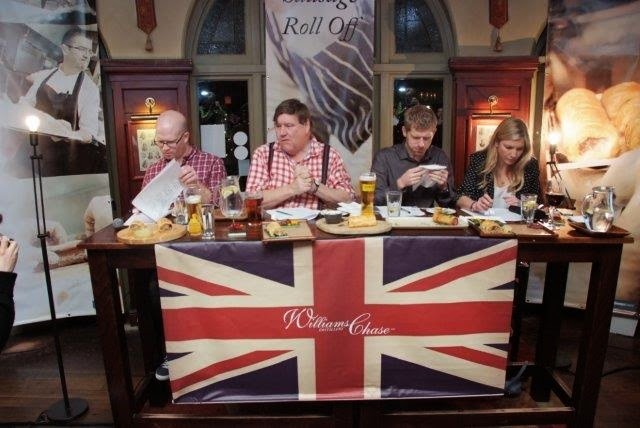 With beer writer Melissa Cole compèring and taking the hold of the reins with her usual commanding style and good humour, this competition obviously has legs for the future but what actually happened on the night? Well, after running all the way from Hammersmith tube station and arriving slightly late, pouring with sweat, it was nice to settle in with a cool and refreshing pint of Chiswick ale and to mill about the place; lording it a touch. Call me shameless but I had no qualms at all about talking with some of the chefs before the competition, just to sound out some ideas and whatnot. However, when it soon became evident that no-one was going to hand me a brown paper envelope, I thought "sod the lot of you then" and joined my fellow judges at the top table to stare loftily down at the simmering crowd. Sitting next to Mr Campion was quite a thrill actually and the man is certainly an interesting character; a curious mixture of warmth and bitterness, sardonic even. Hit the right note and you will get on like a house on fire. Hit the wrong one and well, you could hear a gnat fart in the room. But of course that didn't happen because as the evening went on, the braying chefs got louder and louder the more they got pissed. 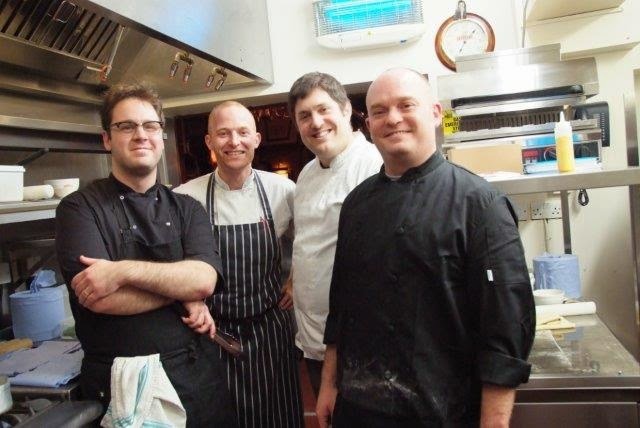 The sausage roll cookery element consisted of four chefs jumping into the pub kitchen at a time, to weave their magic and then present within 20 minutes or so. 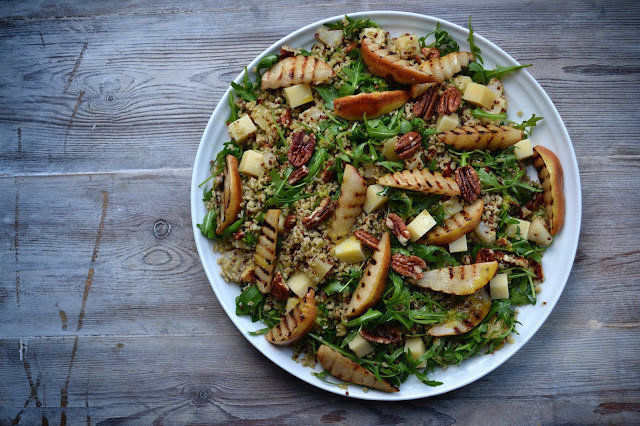 We, the judges, then had to selflessly chomp and chew our way through them whilst studiously making tasting notes and conferring with cheeks full. 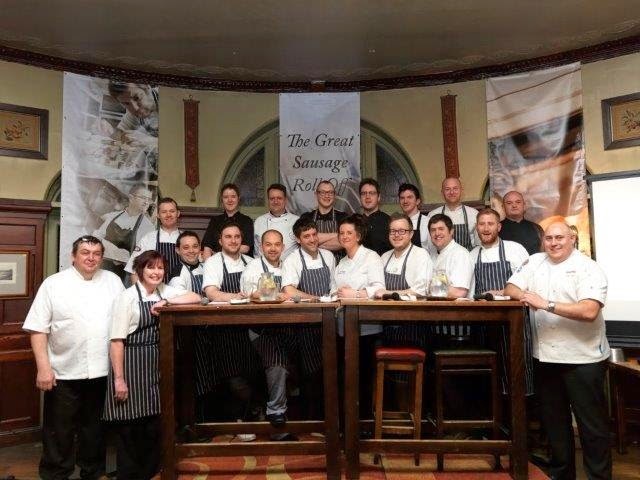 In total, over about 2 and half hours, we sampled SIXTEEN sausage rolls of various quality and stature, and I will not lie, it was a hard job. In fact, it is all a bit of a blur now really and my notes from the evening are now withered somewhat with grease and beer stains but notable sausage rolls for me personally came in the form of a sausage roll packed with offal from chef Phil Harrison. Also a deliciously, crumbly effort from the editor of the Richmond and Twickenham Times reminded me of the good ol' fashioned 'famlee' sausage rolls of yore. That one chef decided to flavour his one with langoustine seemed like blasphemy to me and plus it tasted rather rank, so that was a low point. In general though, all the savoury pastries presented were pretty good. Of course, we had to all agree on a top three (well a top seven to be precise but let's concentrate on the top three) and after some intense conflab, during which Lisa tried to shoehorn her mate Tim into the top of the chart, it was Hayden who dispensed the pearl of wisdom - "C'mon guys, which of these sausage rolls would you like to eat again?" Judging by the hip-thrusting, bird-flicking, tongue-protruding jubilation of chef Chris Brumsby to the crowd, beating his fellow contemporaries obviously meant a lot to him and deservedly so. The nifty addition of quails egg into his pork mix was definitely inspired and more importantly, it was a tasty twist. It did make me laugh though when I heard that his proud dish was soon dropped from the menu at Ben's Canteen because no punter wants to wait more than 20 minutes for a starter. Hey, you live and learn and he should still be happy that his sausage roll was a champion. Like I said, this juggernaut of a competition has no intention of stopping as I believe a date of 28th January 2015 has already been set, so will be interesting to see if any 'superstars' take up the challenge, to see if anyone can totally redefine the humble sausage roll. Saying that Angus is more than happy for members of the public to get involved. I wonder if I could get me muvva to enter? Best not sit on the panel next time on the panel if she does though. I'd never hear the end of it if she lost.